The pedal boxes were removed but I couldn't remove the pivot pins, and they were out of alignment so I purchased a refurbished set of pedal boxes from ANG Classic Car Parts. The metal pedal arms and mounting brackets are all original Triumph parts and they have been chemically dipped to remove the old paint and any surface corrosion. They have then been spray painted with 2 coats of black satin paint to give the finished appearance and have then been fitted with the following new parts : Rubber pedal pad with 'T' logo; Stainless steel pivot pin bolts & circlips; Pedal return springs; UNF Stainless steel bolts & washers. As the brake and clutch mounting brackets were badly corroded/pitted they were replaced with stainless steel ones made by Paul Copeland (Stainless For Classics). 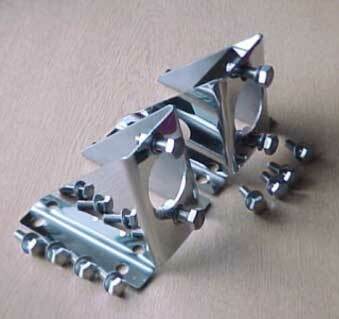 They are made from 2mm Polished Stainless Steel. The strengthening brace on the Brake Cylinder Mounting bracket has been very discreetly silver soldered / brazed on the underside. Therefore there is no unsightly weld visible, which is always evident on the other brackets that are currently available on the market. Both brackets have S/S captive rivet nuts fitted, and they are also supplied with all the necessary stainless steel fixing bolts and washers ready for immediate installation.